Card, sent from Riga to Grenoble, France, on 14 7 12. Arrival-postmark Grenoble 30 July. From 1903 double-ring-postmarks are used: circular nr. 9 of 3 February 1903 introduced the double-ring-postmarks. The old postmarks are replaced when they are worn out. Also a detailed description is given of the new postmarks. 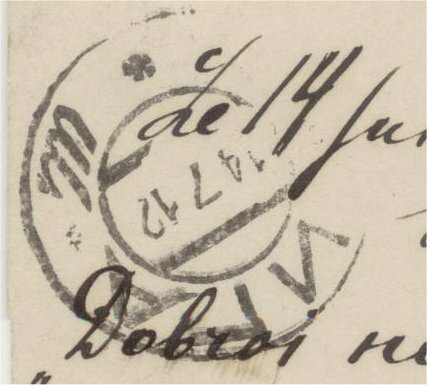 The postmarks consist of two rings, with the name of place in between. Day-month-year now stood on one line (in the year “19” has been omitted. There came two sorts of postmarks: bigger for the mail and smaller for receipts and administrative purposes. On this postmark we see also two stars and a serial-letter: the main post-office. When we have to do with a sub-postoffice (city-postoffice), the second star is replaced by the number of the sub-post-office. The postmark on the address-side of the card. The picture of the card above is a nice view on Riga. The postmark is a double-ring postmark of the main postoffice. 21 07 10 – 20 08 17. We call it here ‘stars’, but it are more ‘ornaments’: V. Marcilger shows in his book 16 different ornaments, used in this type postmark. The book gives also a detailed and extensive classification of the double-ring postmarks. 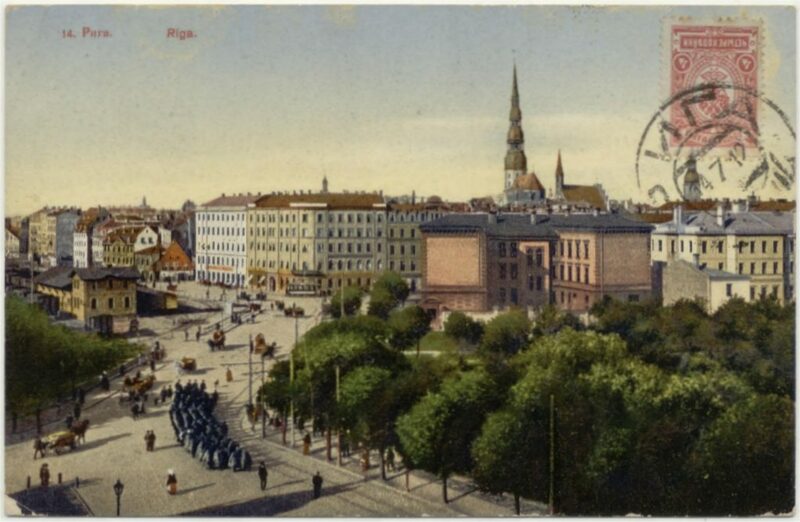 Card, sent from Riga to Paris. On the card above, sent to Paris, also is used a double-ring postmark. 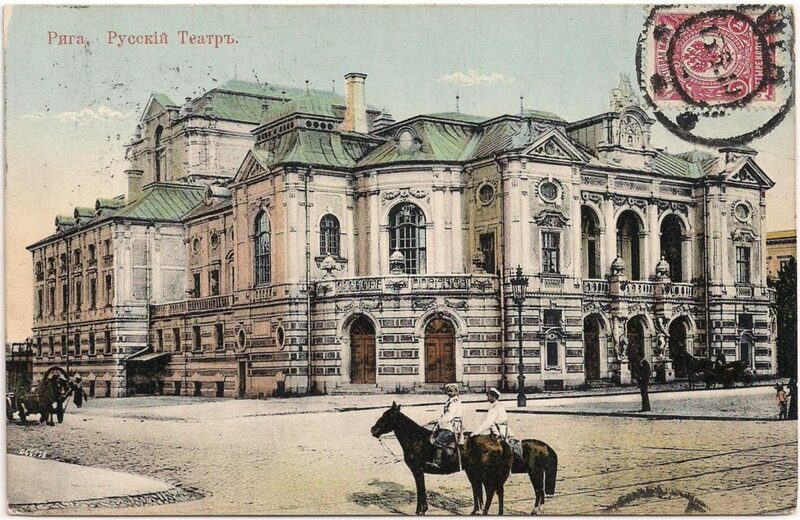 The picture of card is a view on the РИГА, РУССКІЙ ТЕАТРЪ [RIGA, RUSSKII TEATR], Russian Theatre of Riga. The theatre was built 1899-1902 and was the second Russian theatre in Riga. During World War I this theatre was closed, but already in 1917 the first shows in Latvian were held. On 18 November 1918 in this theatre Latvia’s independence was declared. 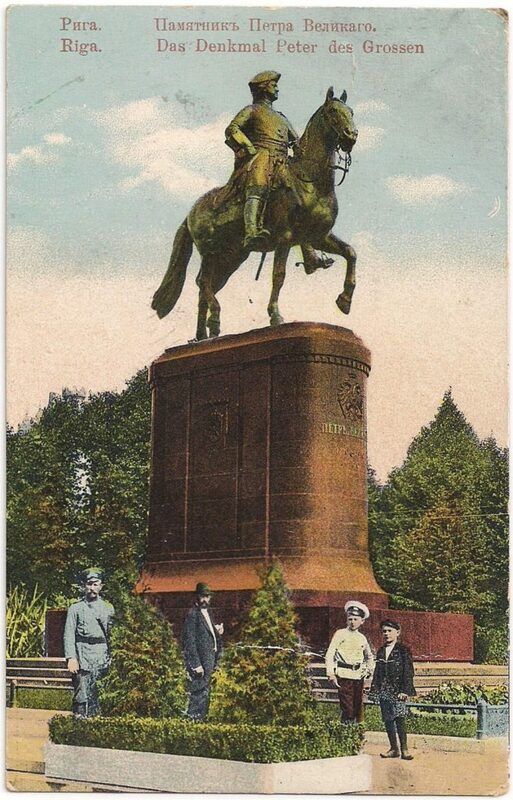 Nice card with the statue of Peter the great in Riga. The statue is made by the German artist Gustav Schmidt-Kassel and is placed in Riga in 1910 on the Aleksandra boulevard. In 1915 it is demontated for transporting it to St. Petersburg. A German submarine destroyed the ship and it gone away in the sea. In 1934 it is found by Estonian divers and it came back to Riga. The name of the street was then changed to Brivības iela (Freedom street), and on the old place was since 1935 placed the new Monument of Freedom. The statue of Peter the Great is repaired in 2003, paid by the merchant Yegeny Gomberg. He erected it on a new place -without permission- in Kronvald Park, on the area of the Riga Harbour Authority. For ultra-nationalists it was a pro-Moscow provocation. When Gomberg should get a penalty, someone else intended to pay for him. So an old statue gives political meaning. 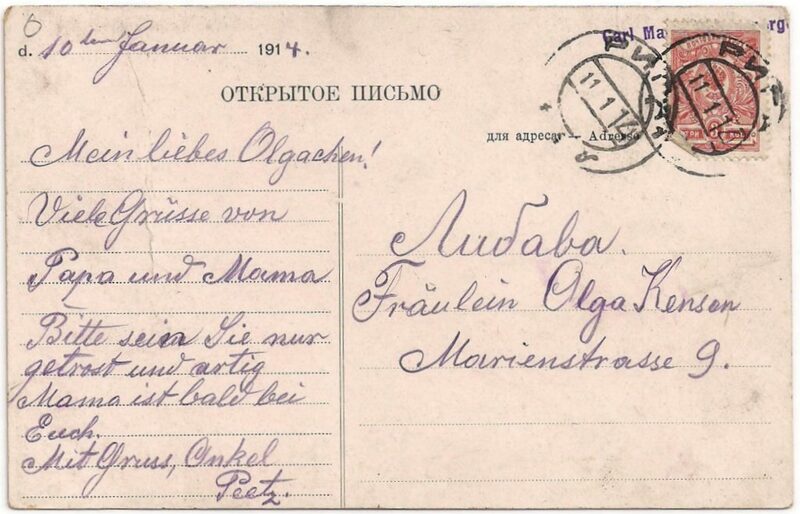 The card is written 10 January, 1914 and has a double-ring postmark of Riga: 11 1 14.